The following is Father Christiansen’s response. IGE continues to work for religious liberty in some the most difficult and remote situations in the world. It also sponsors The Review of Faith in International Affairs, a respected journal for which I serve as a consulting editor. The 2015 Poverty Summit at Georgetown University, in which President Barack Obama asked to be included, demonstrated the great potential for future evangelical-Catholic collaboration for the common good. Of course, Catholic-evangelical relations are not always or uniformly characterized by the kind of professionalism and Christian amity I have described. In some places most of the time and in others from time to time, there are troubled relations. For some years, for example, local World Vision policies in Latin America and Ireland were obstacles to smooth relations. Some Latin Catholics are still suspicious of “las sectas” and vice versa. U.S. bishops have sometimes had to remind evangelicals of Catholic sensitivities and Catholic parishioners of their ties to the local dioceses or Catholic Relief Services. Drew Christiansen, S.J., former editor of America, is distinguished professor of ethics and global human development at Georgetown University. 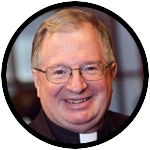 He serves on the seventh round of the United Methodist-USCCB dialogue.